Data has caused massive shocks to business practice today, provoking confusion, wonder, and controversy. While quantifiable data cannot capture all the particularities of our world, it has certainly proved as a potent factor in decision-making processes. In its raw form, the ocean of data out there is often incomprehensible to managers who need to make agile decisions. Business leaders need to navigate this deep and vast terrain in a coherent way, while avoiding unethical pitfalls that can crush public trust in a company. EMLYON Business School's Data R&D Institute produces cutting-edge research on the subject, while preparing students to leverage data with ethical considerations in mind in their future careers. "Today's businesses demand data-literate employees," says Lynn Cherny, development head at the institute and associate professor at EMLYON. "We need to be training the next generation of data analysts, as well as the next generation of business leaders who can build products from ethical uses of data." Lynn says that students are often expected to analyze data, create charts, and interpret charts for cases when applying to consulting companies. To complete such tasks, MBA candidates must know basic statistics, have the ability to draw insights from data, and present information to a broad audience that tells a clear business story. "Our Data R&D Institute at EMLYON Business School takes candidates from introductory analytics and programming, all the way to machine learning, predictive modelling, and natural language processing," Lynn explains. Previous EMLYON MBA graduates have harnessed the strength of data in their entrepreneurial initiatives. Michael Fernandez-Ferri founded his startup, DRUST, straight out of his degree. Michael's company is an intelligence platform for connected vehicles. "Our decision-making process is based upon three things," Michael says, "The first is intuition based upon our knowledge and gut feeling. Second, data insights from the market. Finally, we use data analytics from our users and prospects. Data is definitely a key driver in this process." Through his MBA at EMLYON Business School, Michael was equipped with business modelling skills that enabled him to understand the complex ecosystem in which his startup would operate. He says that learning about marketing, finance, and strategy as part of the program helped him in establishing DRUST. Strategy and data work must complement each other in any business. The former directs the type of data that must be collated, while the latter reveals trends that help achieve or remold business strategies. The key issue here is being able to extract insights and trends from huge volumes of information, and presenting them in an understandable way. 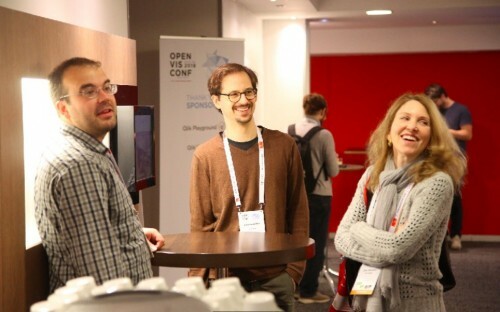 Recently, EMLYON Business School's Data R&D Institute held the OpenVis Conference focusing on how to visualize data and format it in an intuitive manner. Lynn ran the conference for five years in Boston, before spotting the opportunity to bring it to Europe this year with the support of EMLYON's dean, Bernard Belletante. "The conference is precisely in line with the goals of the institute, in that it blends the latest in academic research with best practices from developers and data journalists," Lynn says. The two-day conference at EMLYON Business School included talks from the Google Brain team on visualizing big data sets with machine learning and understanding the workings of 'neural nets'—computer systems modelled on the human brain. Presentations and panel discussions were followed by hands-on workshops teaching students ‘design and web coding skills’. Lynn explains that students volunteered to help with the conference, "enabling them to attend for free and meet speakers." She says that upon graduating, some of her students have "hopped right into data science jobs, highly sought after internships at New York City data startups, or strategic analysis roles at companies like Salesforce."